People may be interested to know that Corgi are bringing out a more toy-like NBfL model later this year, retailing at an RRP of £9.99. Possibly a useful thing to know if you like converting models? woop where can i see it? The Les Miserables one is now available, ONLY from Corgi Direct, and I understand it's selling rapidly. NBfL enthusiasts might be interested to know that Corgi have just announced (literally this morning) that a new model of Go-Ahead's LT59 on route 11 will be released in April 2014. 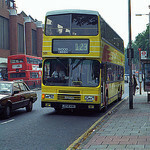 I would love them to do a model of a London B9TL, whether it be Go Ahead, Metroline or Tower Transit. Do you know roughly when? Corgi are saying May, but that date may slip.